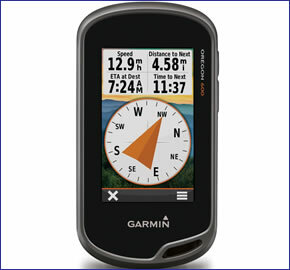 Garmin Oregon 650 is the latest handheld GPS device from Garmin. Featuring a 3-inch TFT transflective display which can also be zoomed-in and panned-out with ease. Plus the screen is also dual-orientation display meaning you can view in landscape or portrait. Garmin Oregon 650 device is preloaded with worldwide basemap with shaded relief. It also features an 8 megapixel camera and 3D compass and barometric altimeter. Furthermore this device is ready for paperless geocaching giving you full descriptions, cache photos, hints and logs. The Oregon 650 also includes 3.5GB of internal memory to store data/maps/routes, etc and your photos too. Garmin Oregon 650 has been discontinued. Accessories are still available for your Oregon 650 click here. Likewise for maps click here. The Garmin Oregon 650 is a premium device in the Oregon 600 range. The pocket-sized Oregon 650 handheld sat nav has dimensions measuring just 61mm wide, 114mm high and 33mm deep. Waterproof to IPX7 standards it's perfect and ideally suited for adventures on the trail, on the road, off-road and on the coastal waters around the UK and Europe. ‣Plus the Oregon 650 includes a NiMH battery pack and AC adaptor in the box. The Oregon 600 series, which the 650 is part features Garmin's best ever screen on a Garmin handheld device. The Oregon 650 features a transflective colour 3-inch (diagonal) TFT touchscreen display which is also sunlight readable and strengthened for impact resistance too. The TFT display uses both sunlight and its’ LED backlight to control brightness meaning you can conserve power used by the backlight of the device and rely upon the sun light. Plus like the Garmin Montana handheld range, the units screen can be viewed in either landscape or portrait view, simply by holding/turning the unit - giving you the best view on the route, road or water ahead. In addition to the units stunning display, the Garmin Oregon 650 also features a built-in 8 megapixel autofocus camera (another Garmin first). It provides digital zoom and automatic flash - which can also be used as a torch. Every photo taken is geotagged so that you can navigate back to the same location again. The Oregon 650 also has a built-in 3-axis 3D electronic compass, barometric altimeter and wireless connectivity with other compatible Garmin handheld devices. This enabes you to wirelessly share geocaches waypoints, tracks and routes with other device owners. Plus with its vast internal 3.5GB memory you can store up to 4000 waypoints, 200 routes and 10,000 points on 200 saved tracks. Preloaded to the premium Oregon 650's memory is a worldwide basemap with shaded relief. If you require topographical maps we recommend you buy the Oregon 650t instead. These maps provide rich map data with contours, elevation, roads and rivers, etc. The scale of these pre-installed topo maps is 1:100k. Additional maps and charts are also available for the Oregon 650. Mapping options include: City Navigator street-level road maps, BlueChart g3 marine charts, TOPO maps and GB Discoverer Ordnance Survey LandRanger maps at 1:25k or 1:50k scale. Each of these maps are available on SD/microSD Card. To view optional maps for the Oregon 650 click here. The Garmin Oregon 650 can be recharged using its rechargeable NiMH pack (included). You can also power the 650 using traditional AA batteries if you cannot recharge the system whilst you are using it on an adventure. The NiMH pack battery life is 16 hours. The unit features a WAAS-enabled GPS receiver and GLONASS satellite tracking meaning there are more satellites for the device to lock on to. This will ensure you maintain satellite fix in built-up areas and woodlands. With BaseCamp software you can plan your trips viewing waypoints, tracks and routes before you set out. Share information about your adventure(s) with friends and family in 2-D or 3-D on a computer screen, including contour lines and elevation profiles. Do you have a question about the Garmin Oregon 650 or other handheld GPS related question that's not been answered on this webpage? Please see our handheld and Outdoor GPS FAQs page for questions from other customers.Plus if the answer to your question isn't featured, use the online form to ask us for the answer. Alternatively please telephone 01733 777623 Monday to Friday (9:30am-5:00pm) to speak to one of our sales team. For further information online please see the Garmin Oregon comparison table. Garmin Oregon 650 is preloaded with a worldwide basemap with shaded relief. Additional pre-programmed Garmin maps on SD/microSD card can also be added including TOPO maps of 1:50K Great Britain, 1:25K Great Britain, France, Italy, Spain, etc. Learn more about the available maps for the Oregon 650. Looking for accessories to use with the Garmin Oregon 650 handheld device? We sell a vast selection of genuine parts and spares including Oregon 650 carry case, retractable lanyard, carabiner clip, bike mount, automotive mount and charger, temperature sensor and chirp geocaching beacon. Optional Garmin maps for Garmin Oregon 650 are supplied on SD/microSD Card, these include; street-level road maps - perfect for cycling of using your Oregon 650 in a car, 1:50k and 1:25k Ordnance Survey maps - ideal for hiking and walking the countryside of Great Britain and marine BlueCharts - ideal if you want to navigate the waters around the UK, Europe or further afield.